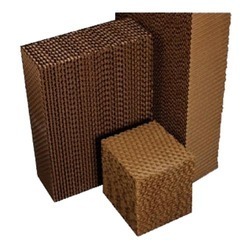 We are leading Importer for the evaporative cooling pad which also includes Cellulose Pad, since 2000 Flow Cooling Pads are made of cellulose corrugated paper glued in an opposite sequence, which generates air passage inside the pads. These sheets have very high ability in absorbing water and are chemically treated to prevent disintegration. Flow Cooling pads are energy saving, environmentally friendly and economically viable as they reduce temperatures without gas emissions and at minimal energy costs with the right controllers. 5090 Pads are 5 mm structure pad which has extensive water absorption capability, hence provides more cooling as compared to any other size cooling pad. Its available in Brown/Green & Brown Colors.